Miniature American flags border the walkways at Columbia College’s main campus, stuck in the ground about three feet apart, 2,996 flags in all. 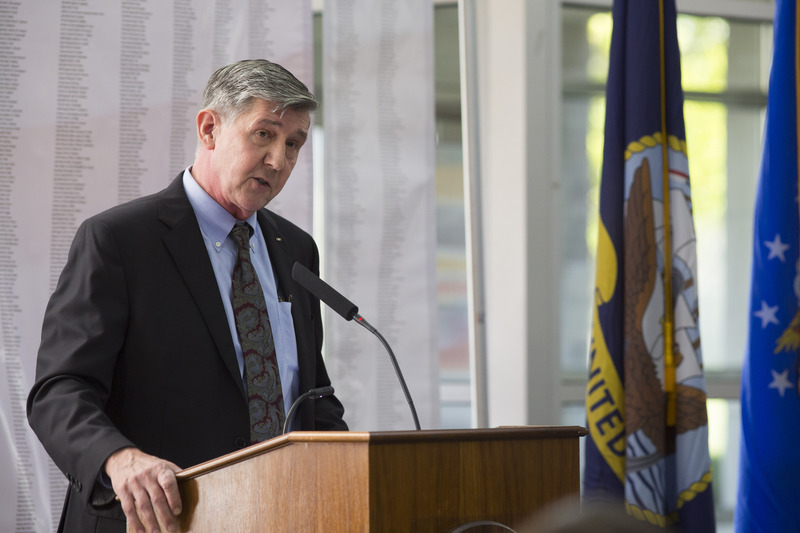 Lieutenant General Richard Harding, a former Air Force Judge Advocate General and current Columbia College trustee, speaks at the Veterans Day remembrance ceremony. The number represents the people who lost their lives during the attacks on the World Trade Center on September 11, 2001. The gesture, combined with the yellow ribbons tied around trees on campus, represents gratitude for the men and women who fight — and have fought — to keep our country free. “We’re trying to recognize all our military and veteran members of our school community,” Columbia College director of Veterans Services Keith Glindemann said. “The takeaway I’m hoping for is that those who have served or are continuing to serve will know that we honor them. More than a dozen volunteers gathered on the morning of Monday, November 7, to help decorate the campus for Veterans Week, five days of celebrating the military that culminated on Veterans Day (Friday, November 11). In 2015, Columbia College served nearly 9,500 servicemembers, veterans and military dependents and spouses. Veterans Week serves as a chance for the college community to give a little for those who have given so much. Miller, a junior criminal justice major with a legal studies minor, is one of the more than 5,000 Columbia College students who are currently serving in the military. He envisions his club as a resource for students like him, veterans, family members and any others in the college community who are looking for ways to support military students. He and the CCSV club took part in the “22 Pushup Challenge” to raise awareness of the estimated 22 veterans a day who commit suicide. Each member of the club did 22 pushups a day for 22 days — the last falling on Veterans Day — and posted videos online, along with links to resources such as the Veterans Crisis Line. On Veterans Day, the club joined together with other students, faculty and staff at Southwell Complex to complete the final day of the challenge. Columbia College held a number of activities to commemorate Veterans Day, including a ceremonial flag raising on Bass Commons, participating in a national moment of silence later in the day and lighting the Military Service Tree at dusk. And, for the sixth straight year, the school took part in a remembrance ceremony to honor the 6,872 American servicemembers who have died since the War on Terror began in 2001, all of whose names were printed on banners displayed behind a stage at Atkins-Holman Student Commons. Jennifer Boyt, a systems analyst in Technology Services and an Operation Iraqi Freedom veteran with the Army National Guard, read the names of the 31 who have lost their lives since last year’s ceremony, and other Columbia College staff members read citations for the three new Medal of Honor recipients since last year. Lieutenant General Richard Harding, a former Air Force Judge Advocate General and current Columbia College trustee, addressed the crowd and stressed the nobility of serving one’s country. “Patriots have served regardless of political party or personality in charge at the time,” Harding said. “What drives young men and women and their predecessors from every earlier generation to raise their right hand, swear to protect the Constitution against all enemies, foreign and domestic? There’s something inside the heart of those who protect freedom that calls them to humility and the service and sacrifice of the self.